Here's a costume you don't want to run into in a dark Mega-City One alley. 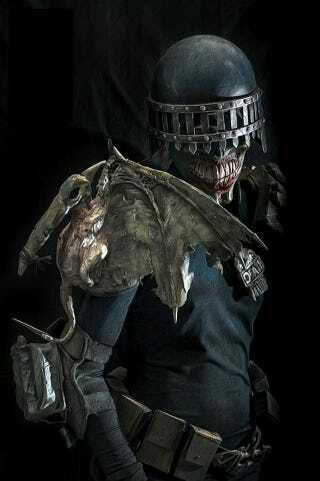 Judge Death, one of the Dark Judges of 2000 AD's Deadworld, comes to unlife in this horrifying costume. Judge Dredd battled Judge Death after the alternate-universe Judge crossed into Mega-City One, trying to eliminate the crime of life. (Death made subsequent appearances in the 2000 AD comics and even crossed over with Batman) deviantART user warrior1944 designed this Judge Death costume, which was then fabricated by Helsinki-based Head Hunter Store. Head Hunter is selling the costumes—complete with display mannequin—but this piece of costumed terror will set you back €2,000. warrior1944 has more photos of the outfit in his deviantART gallery.